From 1966 to 1969 I worked as an audio typist in the claims department of Norman Frizzell and Partners, which was based in their annex above Kitt’s in the High Street. I was a member of the company’s netball team and we practised after work at Billericay School where I got to know some of the youth club. 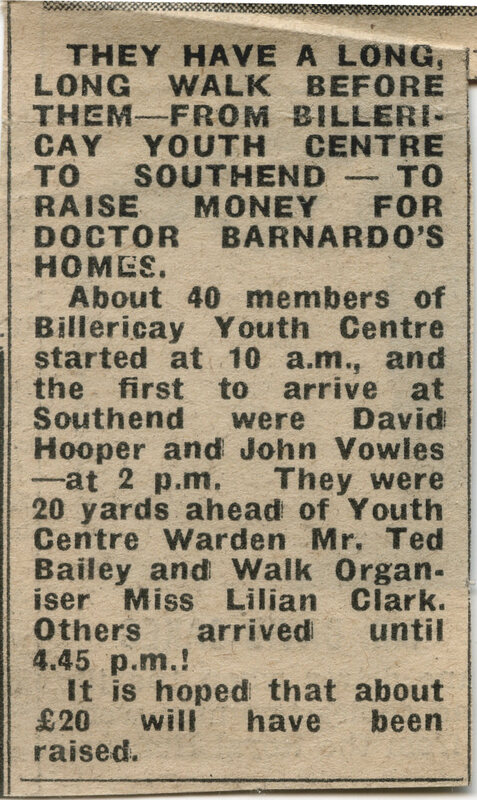 In the spring of 1967 I was invited to join them on a walk from Billericay School to the end of Southend Pier to raise money for Dr Barnardo’s homes. I attach some newspaper cuttings of the event. 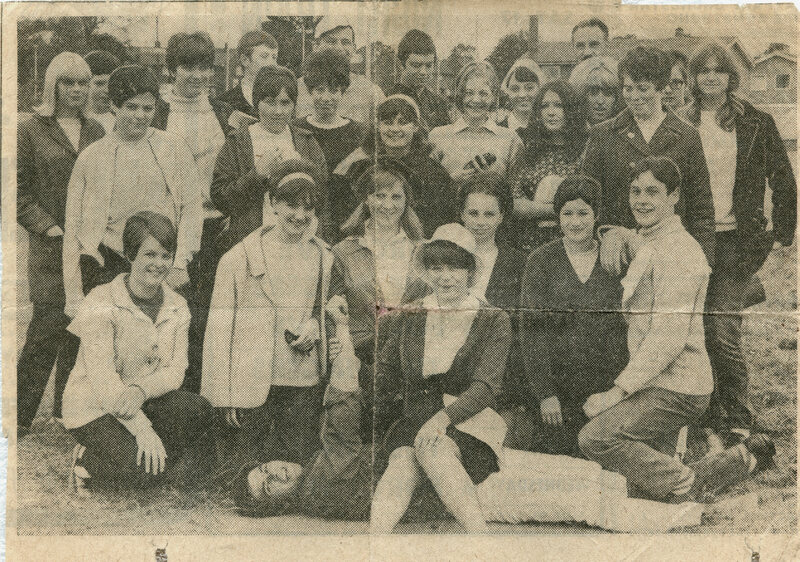 None of us had shoes fit for purpose, as proper trainers weren’t readily available until the early 70s, therefore several unfortunates had to drop out along the way due to blisters. I wore sandals and carried a spare pair which I swapped every couple of miles thereby managing to avoid developing blisters. We set off at 10 am and I arrived at the pier at 4 pm. We all had our numbers pinned to our backs and as we walked down Southend High Street towards the pier, there were several calls of ‘Come in Number .…’ It was a most enjoyable day although I remember limping for several days after because both my ankles felt sprained. I seem to remember raising about £10 in donations from family, friends and workmates. I am sure the final total collected was far more than the £20 mentioned in the article. The previous year I had taken part in the Billericay Carnival, riding on Frizzell’s float along with some workmates. We were dressed in mini-skirts and white boots. I will try to locate some photos. 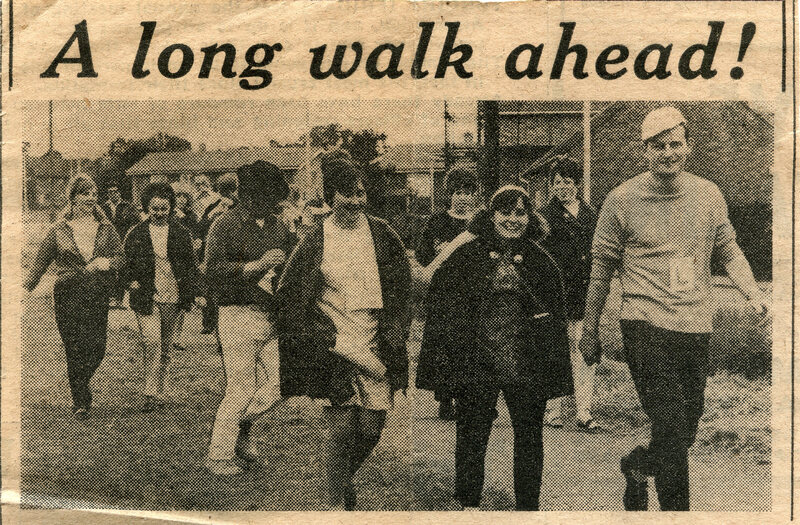 This is a great article, and shows what a community spirit existed then. I have looked at the newspaper photos and see that the pictures were taken at South Green, on the NE corner of the green, with the then fairly new houses no’s 1 and 3 Outwood Common Road, and also you can just see Well Mead in the far background. That was quite some walk to get to Southend, no wonder some stopped at the pub. By the way, we got more than £20 and anyway that’s worth about £350 or more in today’s money … does anyone remember the route we took or anything else of interest? I remember itt well … Robert Rigby and me agreed to run for more money but did we? We certainly stopped off somewhere for a half-pint because it was a very hot day. Well organised Nina!